Farmers play an important role in our lives. They provide us with safe and quality products such as milk, eggs, meat and seafood. In this new series we are pleased to share stories of farmers and their contribution to sustainable farming in Asia Pacific. We hope their passion and commitment to animals will inspire more farmers around the world to continue the drive towards sustainable farming and even better approaches of caring for the well-being of farm animals. 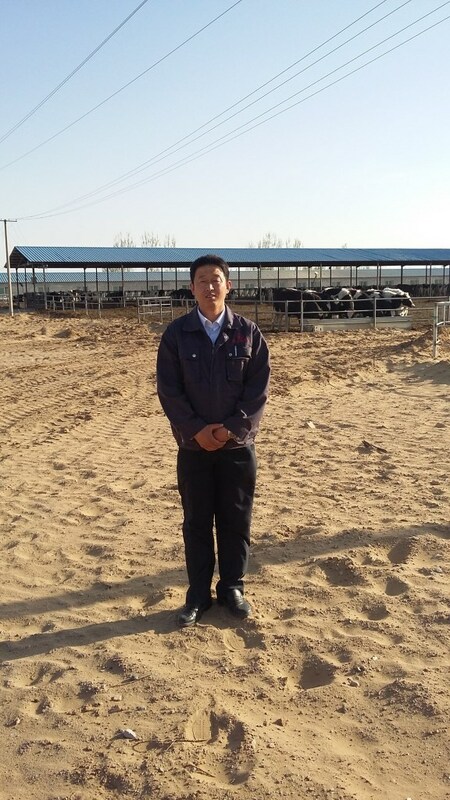 Today, we speak with Mr Zhang Xuelong of Ordos Knight Ranch in Inner Mongolia, China, who shares how he ensures the health and well-being of his dairy cows. Thank you, Mr Zhang, for sharing your story with us. Sustainable farming helps ensure the safety of our food sources. We find out more about how a dairy farm company in Inner Mongolia, China, is doing its part to practise sustainable farming, taking good care of its cows so that we can all enjoy better and healthier dairy products. 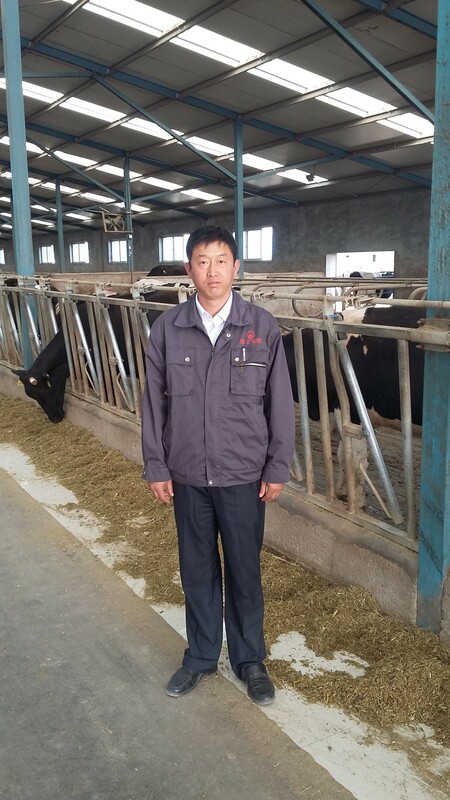 With 15 years of dairy farming experience behind him, Mr Zhang Xuelong of Ordos Knight Ranch in Inner Mongolia is an “old-hand” when it comes to taking care of cows. 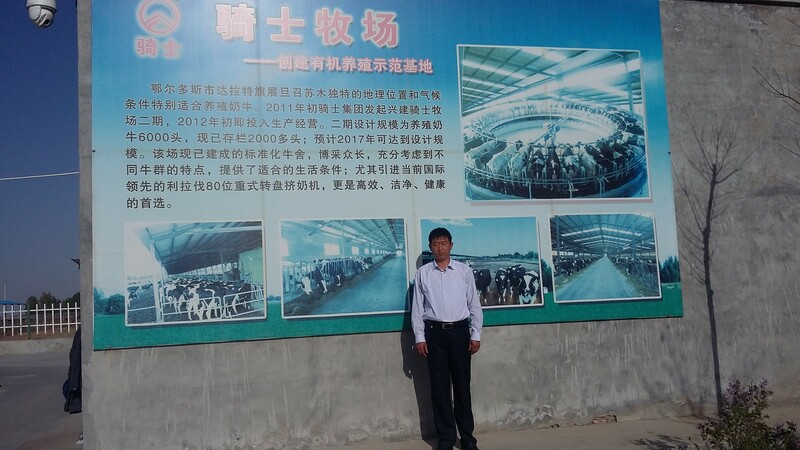 A subsidiary of the Inner Mongolia Knight Dairy Farm Co., Ltd, Ordos Knight Ranch is committed to building a complete dairy industry chain – from planting and forage processing, to dairy farming and dairy processing.To ensure the safety and quality of its milk source, the company has adopted an organic breeding cycle. The company’s farm and ranch successfully obtained the international organic certification from the China Organic Food Certification Center in 2012, as well as ECOCERT’s organic certification in 2013 – one of the few companies with both certifications in China. Currently, the company owns more than 20,000 mu (1333.3 hectares) of mechanised modern grassland, and two modern farms with over 3,000 cows. What does sustainable farming mean to you at Ordos Knight Ranch? To us, it means being responsible in our farming practices and using a new sustainable farming model that includes organic agriculture, ecological agriculture and natural farming. Under the organic farming model, the forage comes from our own organic farm, and animal manure is used to improve soil fertility. When we were young, we did not have enough food to eat, especially not meat and milk. While some of the older generation still regards milk as a luxury nutriment, this perception is changing as agricultural production has increased considerably in line with the rapid development of China over the last years. Today, milk has become a daily necessity instead of a luxury nutriment. However, the excessive use of chemical products has brought about challenges such as more barren land, worsening ecological environments and food insecurities. As our life gets better, we begin to realise the importance of food safety, and our demand for safe food and consideration for the environment increases. Therefore, new agricultural production models, such as organic, ecological and natural agriculture, are being adopted by enterprises and individuals. In order to meet consumers’ demand for healthy and safe dairy products, our company began trying organic breeding and planting, and advocating sustainable farming models. What do you do for your animals at Ordos Knight Ranch that you are proud to share with others? As the saying goes, an army marches on its stomach. During the animal breeding process, forage preparation, storage and processing are very important. The fodder for our ranch comes from our own organic farm, and through the planting and breeding cycle, the manure from the ranch is applied back to the land, greatly improving soil structure and fertility. So our farm and ranch support and sustain each other. In addition, the farm has a complete annual crop rotation programme, and the planning of seed selection for resistant varieties reduces the risk of forage crop pests. The use of chemical pesticides is prohibited to ensurea stable yield of safe forage from our crop. Next, we ensure our cows have a good living environment, and emphasize the well-being of the animals. There are three essential things for dairy farming: eat well, drink well, and rest well. So, after having adequate and safe forage, we need to create a good environment for the cows. For example, our deep-well water supply ensures the safety of our drinking water; electric heating tanks keep the water at the right temperature in winter; and insulation barns keep our cows comfortable during winter; while mist fans reduce heat stress in summer. Each cow has its own bed, all beds and playground mats are clean, and sand layers are thick and loose, all ensuring the health and wellness of our cows. We also ensure a rational herd density. All these measures to improve the environment are reflected in our daily work. We treat cow diseases by following the guidelines of “prevention first, comprehensive management.” We apply a reasonable daily dietary structure to meet the cows’ nutritional needs, and improve their immune systems. Through vaccinations and a strict quarantine system, we reduce the chances of diseases spreading. Post-partum cows are treated through specially-mixed herbs, enhancing their immunity and preventing diseases. If any cow suffers from a disease, we first adopt traditional Chinese and Mongolian veterinary treatment, such as herbal medicines. If necessary, we will ask professional vets to treat it with therapeutics allowed by national organic standards, to alleviate the suffering of the cow and help it recover quickly. To ensure safety of milk source, cows that have been ill will only return to the milking station after no less than double the withdrawal period, since its milk will be sold as organic milk. We hope that through our efforts in sustainable farming, we can bring consumers healthier dairy products. If you are interested, you are welcome to visit our ranch and farm to learn more about what we do.